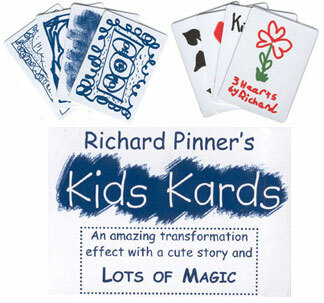 Today, when you order "Kids Kards by Richard Pinner", you'll instantly be emailed a Penguin Magic gift certificate. You can spend it on anything you like at Penguin, just like cash. Just complete your order as normal, and within seconds you'll get an email with your gift certificate. Kids Kards by Richard Pinner This is an instant favorite. It's VISUAL, fun, and the routine plays well in any venue. I could not be more disappointed with the two Kids Kards I bought recently (by FEDEX to Brazil and custom taxes) from Penguin. The instructions of Mr Pinner and Oz Pearlman will tell you that the cards will fall in pairs but it is not true with the decks I received. The roughing fluid does not work and Penguin suggested that I should look for a spray with roughing fluid in Brazil to fix this problem myself! This spray is unknown where I live and I think the manufacturer should guarantee the quality of this product, the prejudice is mine - right to the trash. Stay away from Kids Kards and save your your money. To be honest, other than the classic Coloring Book ... you won't find a more visual effect to perform for children. This is one of my go-to routines when I'm performing Strolling Magic. Great for one-on-one or even for small groups, everyone gets involved. I must have performed this thousands of times ... no joke. Heck I must have a dozen of these sitting around. When I get a chance I spray them with Testor's Dull Coat as needed. Truly the best gaffed deck on the marked for children! Highly Recommended! This is perfect for strolling magic. The story is engaging, the cards are charming, and the effect is powerful and extremely visual. I highly recommend it! I love, love, love this trick! It is so straight forward, easy to do under surrounded situations, multi-phased, entertaining/stunning for both kids and adults, and automatically reset. What more could you want? I had a walk-around outdoor Christmas festival gig in December in Canada, which can be kinda cold on the hands and made it difficult to do sleight of hand.. this fall-back effect was a life-saver! spread PERFECTLY..fan perfectly..WORK perfectly...this is a gimmicked deck that i have used for many many years.. i actually wore them out after 5 years and just purchased another one..this trick KILLS...adults AND children..PERFECT for the resturaunt worker,or any walkaround magic..the perfect FAMILY trick... LOVE IT! This trick is a lot like the mental photography deck but with a different, just as cool ending. Spectators really like to see the uniqueness of the cards and they are just blown away when they all change to real fronts, and even more blown away when the backs change too. The downside is that the deck can't be inspected but if your presentation is down pat then you won't even be asked. Pick this up and you'll have a lot of fun performing it. Kids Kards is my newest and favorite trick to perform. Dont let the simplicity and look of this set deceive you. I personalized the patter so it involves my kids, and it is so stronger and better. This three phase routine is great because it builds each step of the way. And the metal prediction at the end blows the audience away. I performed this at my local IBM Ring and got great feedback. They loved the story behind the cards. This trick plays real well for children,with the right patter it can be a good trick for adults as well. Also its really 2 tricks in one its a deck change and a mind reading trick at the same time. I really enjoy this one. This trick is simply amazing and sometimes deceives oneself when performing. 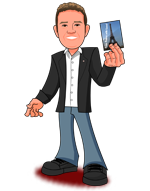 It is self- working although the card change takes a bit of practice but nevertheless excellent trick at a very good price. Mr Pinner, your ingenuity and creativity is exceptional and I thank you for sharing it with us. Couldn't recommend it any higher! 1 of the best tricks ive ever bought. Even my uncle said it was a good trick and he does magic.